The island of Jeju, Korea, is an island of myths, gods and goddesses. It is also the birthplace of the women divers of Jeju. Although the women divers of Jeju are not the goddesses of myths, they are real alive mermaid goddesses. 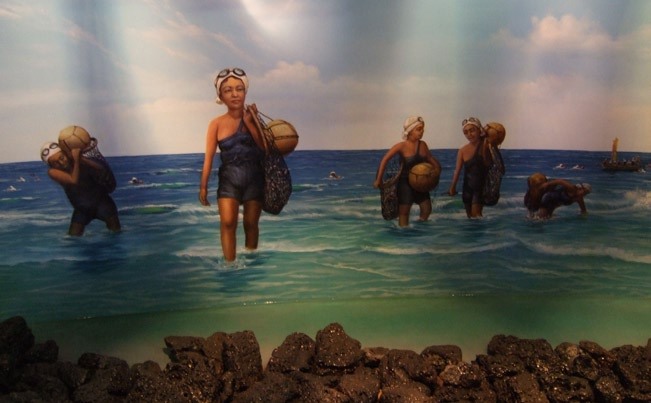 The name for these women divers, in Korean, is haenyeo. It literally means ‘women of the sea’. Traditionally, the women wore only a simple home-sewn white linen combination of pants and a top with lead weighted vests where they tucked the specialized tools of their trade. Precise rituals ensure the women’s survival as they free dive in all kinds of weather searching for shell fish and special seaweeds. The divers stay submerged for two to three minutes at depths of 10 to 30 meters with only a float, or taewak, to mark their position. A bag, or mangsiri, that attaches to the float holds the day’s catch. Although the diving tradition continues today, the women now take advantage of modern wetsuits, fins and goggles. When the divers surface, they make a unique shrill, high-pitched whistling sound that is their way of expelling carbon dioxide from their lungs and breathing in the fresh air. The women divers usually work in groups. During breaks and at the end of the day, they retire to their bulteok. Although the word means ‘bonfire’ in Korean, a bulteok serves as much more than that. It is a term which signifies an open-air dressing room. It also serves as a place where the women meet to exchange information, opinions and foster the diving profession. Diving is still an excellent source of income, and as a consequence, the women divers enjoy more freedom, independence and self-respect than other Korean women. There is a special ranking among the women divers. Group A are the most able divers. Groups B and C are divided based on experience, character and capability. The groups determine who dives from shore, from boats (to 15 meters) and those who specialize in deep diving (more than 20 meters). As the women gather around the bonfire, their seating position in the bulteok reflects their position within their group. When a diver is upgraded, her seating position is changed. Although the working environment of the women divers has not changed appreciably over time, the bulteok has changed. Along with improved diving gear, they have updated their dressing rooms to permanent structures with modern heating. However, the hierarchy of the bulteok is still in practice. When a diver loses her life, the women stop diving for a while. If they find the body, they have a funeral, but if they fail to find the body, a shaman is invited to soothe the soul of the body and send it to heaven. The shaman also performs an exorcism to prevent evil spirits from preventing further disasters.